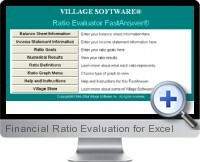 Financial Ratio Evaluation for Excel calculates over two dozen key financial ratios at the touch of a button, and generates presentation quality comparison graphs at the same time. Financial Ratio Evaluation for Excel helps you make your most informed investment and operating decisions using the same ratios that experts rely on to evaluate companies. Plus, it helps you learn how to use these ratios by explaining exactly what each means. Find out what to watch for in each ratio and learn how to discern ratio fact from fiction. Completely button and menu-driven, Financial Ratio Evaluation for Excel puts all the data you need to enter on a single sheet. Just enter the actual data and goals, and the program does the rest. You'll create over 40 sheets of graphs and reports - all in minutes. If you're planning to invest in a company or project, or if you just want to learn more about ratios, this program is ideal. Compare ratios with personal goals or with industry averages. Regularly analyze the numbers and make sure the company stays healthy. Presentation quality graphs can be printed easily from anywhere in the program. Detailed on-line help is always just a click away to give you tips on the easiest way to complete a task. Support is provided by the actual author of the product. You get the author's name, telephone, and support hours at the click of a button. For whom: Ideal for small business owners, investment analysts, financial consultants, business students/faculty, MBAs, CPAs , etc. What it does: Asks for vital financial data and generates reports on key ratios. Financial ratios indicate the health and direction of a company. Ratio analysis is a highly reliable technique followed by thousands of financial analysts to judge a company's performance.